Frenzelit covers the complete spectrum of high temperature sealing and insulation products. Our Novatec product family of compressed graphite, reinforced with Kevlar® and blended with nitrile butadiene rubber, has allowed us to gain significant market exposure. In addition, FSS also offers the traditional compressed nonasbestos sheet products and thermal insulation materials, including millboard and heat shield paper products. Add to this mix various products representing the glass filled PTFE product sector and you will find an innovative, creative supplier that can address the industrial needs for both today and tomorrow. 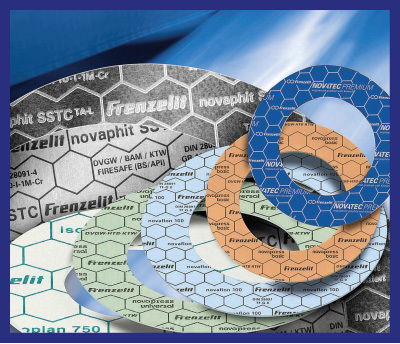 Novapress products are high density, high pressure gasket materials made by Frenzelit using a multiple roll calendaring process. The balanced raw material combination of high quality aramid fibers, special fillers and NBR gives Novapress products the following special properties. Novatec gaskets combine the positive properties of graphite and Kevlar®. The material owes its excellent resistance to temperature and media to the high percentage of graphite and its high tensile strength to the Kevlar® fiber used. Novaphit SSTC consists of highquality, expanded graphite and an expanded metal insert made of acidproof stainless steel 1.4404. 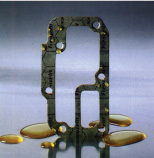 Gaskets with an extremely high loading capacity result from the special manufacturing process. Novaflon 100, 200, 300 and 500 make up the family of Frenzelit’s latest product range of modified PTFE materials. All purpose use in the chemical, petrochemical, pharmaceutical, paper and food industries. Isoplan grades have a well-balanced density and are suitable for both high temperature insulation and sealing against inert gases up to an internal pressure of 3 bar (50 PSI). Novaplan products address the sealing needs of automotive, air cooled engines and moderate duty industrial applications. Frenzelit uses the beater addition method to produce these homogenous products in roll form in a variety of gauges. Novaplan 70 is a medium density, NBR blended gasket material reinforced with natural fibers. The result is an economic, conformable gasket material with good sealability characteristics. N-5408 is a gasket material composed of multiple fiber types blended with multiple elastomers, which address the industrial and transportation markets‘ need for a universal conformable product. The final result is a high performance sealing solution that is used in a wide range of applications. N-7729 offers excellent torque retention, resistance to extrusion and superior sealability. It is the economic solution to a myriad of demanding applications due to the combination of nitrile rubber and Kevlar® fiber. N-7729 is perfect for use in flanges that require a soft, conformable gasket material and where the typical application environment includes elevated temperatures and significant loading. Novaform SK material uses a heavy-duty galvanized steel wire woven with a zigzag construction as a base, onto which a proprietary mixture of inorganic fillers, aramid fibers and NBR rubber are pressed and cured.